From Mav: There are many reasons I wanted to start this podcast. Obviously I like talking about the topics that we cover here a lot… sure. And honestly, a lot of what we do on the show is me working out concepts that I am addressing in my own work (or one of the other hosts is addressing in theirs). And the show has been great for that. But it took me a while to pull the trigger and get it started. Wayne and I had talked about it for years. Katya and I had separately talked about it for years. I hadn’t met Hannah yet, but I’m sure if I had, we’d have talked about it for years too. But if there’s one thing that might have really pushed me over the edge and made me get the ball rolling… it was the opportunity to play a game. The Box Office Fantasy Game. Our friends at The Protagonist Podcast, Joe and Andrew Darowski, have a game that they play on their show every year, and I’ve been fascinated by it. So much so that I said to my co-hosts that when we start the show, we are DEFINITELY doing this… I told the Darowskis that i was DEFINITELY stealing it (we have their blessing… I think in many ways, their goal is to have the game spread to every podcast ever). And now, since the new year is almost upon us. It’s time! Here’s how the game works. All four hosts (actually five, I think Max of Thoughtform Music who wrote our theme song is also going to play) of the show are going to have a round robin fantasy draft where we each pick 12 movies that are set to premiere in 2019. Just like in fantasy football, no two people can have the same movie. 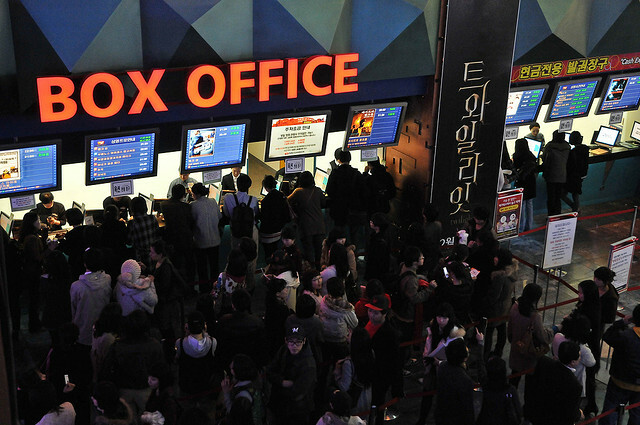 The goal is to amass the highest US domestic box office total by the end of the year. BUT, there’s a couple caveats. You don’t get the entire domestic box office for the film. You only get the money that it amassed DURING 2019. This means, Star Wars IX(Dec 20th) only has 12 days to amass it’s entire total, but Escape Room(Jan 4th) has the entire year…. or at least as long as it can manage to stay in a theater of some kind or another. Furthermore, whatever the box office total is gets modified by the Rotten Tomatoes critic score. So a movie that makes $100M but only has a 50% is worth $50 and if a movie makes a billion dollars, but critically bombs and gets one of the rare 0% ratings, it’s worth nothing! You can’t possibly understand how stupidly excited about this I am about playing this game. So, think of this as the 2019 box office fantasy combine. Help us handicap the list. What movies should we be looking at to draft? What should we avoid? What’s going to make the most money and what’s going to have the best (and worst) critic scores. And how do you think each of us will do in the game? I’m going to go ahead and say that Katya is going to win. Rotten Tomatoes score change regularly. What is the rule for determining the applicable RT score? so does Box Office… the official modifier is the score at the end of the year. If the 20 opening reviews are positive… and then there are 200 negative ones… that’s part of the fun of the game. And speaking of rules, what happens if a movie we pick in December 2018 is later bumped off the the 2019 schedule or is moved? you just lose it… it’s like when you play fantasy football and your star running back gets injured the day before the season starts. That’s part of the fun. It happens on The Protagonist Podcast every year. I’m going to go right ahead and say I don’t know the rules of fantasy football, nor do I plan to learn them. I don’t think you really need to. This game is actually a lot simpler. There’s no positions or anything… just 12 movies. Rules for Fantasy Football: 1. Pick Tom Brady with your first pick. 2. Win. etc… So, sure… if you draw the first pick, you can take Captain Marvel… but then you don’t get to pick again for 9 more picks… so all the other obvious big blockbusters are gone. I’m putting in my early prediction now. I think Captain Marvel will be the highest movie in this game. I don’t think it will out earn Endgame, but I think the reviews will make up for that difference. Yep… figuring that out is totally the fun of the game. I highly recommend listening to the eps of Protagonist where they play. Just glanced at the 2019 movie list. There are at least two full rounds of obvious blockbusters. Round 3 is where it gets tricky. I’m leaning towards Glass or Happy Death Day 2U in that round. Feel free to start a separate thread with your full predictions… I’d love to see like dozens of people trying to handicap this thing. On The Protagonist Podcast we call a film getting bumped from the full calendar year “Getting Creed 2ed,” because Joe had Creed 2 in 2017, but it got bumped to 2018. In 2018, Joe got Creed 2ed by X-Men Dark Phoenix and Hellboy, and Todd got Creed 2ed by New Mutants (which was supposed to come out in March when he picked it, but it got pushed all the way to 2019). Todd also got reverse-Creed 2ed with Deadpool 2 coming back for a December run in theaters. The Protagonist Podcast: The best part about this year’s draft show was that you complained about Creed 2…. and then did the draft and then New Mutants got bumped like a week after the show came out. Like,I knew it had been bumped by the time I listened to the ep. There are at least 10 (and probably a few more) obvious blockbusters already slated for 2019. I expect the majority will come in at about 1/2 a billion to a billion dollars and about 80% on RT. I expect that Endgame will top out the revenue, but end up low 80s, maybe even high 70s on RT. I expect Captain Marvel will be just slightly lower on revenue, but will score low 90s on RT, giving it the edge and making it the top scoring movie in this game. On the other side of the blockbuster scale, I think Dark Phoenix is a disaster that will eek in just under 1/2 a billion AND will barely break 50% on RT. The interesting rounds are round 3 – 5. This is where the blockbusters have run out and you need to rely on modestly high earners with good RT scores to get incremental points. If you’re first two picks are bad, you have already lost. But if they are competitive, these picks will be the difference between 1st place or 3rd place. Right now two movies stand out to me as top choices here: Glass and Happy Death Day 2U. Both have a pedigree of being in a franchise that both does better than expected and gets better reviews than expected. I think Glass has the better release date for earning revenue, but both have loyal fans. I’m curious to what you think the 10 obvious blockbusters and their order is. Not ordering these yet (other than ones I mentioned). And because I am on the fence on those, my comments about Glass and HDD2U should probably be pushed to round 4. Interesting side note. At this point, probably because Endgame releases on April 26, nothing is scheduled to release on May 3. Nobody wants to compete with that juggernaut. See, those are all interesting, but I don’t think I feel quite as bullish on all of your top picks as you do. Obviously, since I’m playing the game, i can’t exactly say which ones yet. Dark Phoenix is the only one I expect to fall under 1/2 a billion (assuming worldwide box office) in that top 12. Every other movie seems to have the combination of timing and pedigree to break that threshold. How far is something I’m not yet sharing (nor how good I think they will do on RT). $500M is a LOT of money… remember, only domestic BO counts. Ohhhh… I missed that. I was calculating global. That changes the numbers, but doesn’t really change my expectations on relative revenue. Except that I am giving some of the 2nd string movies a mental boost because many of them will do better domestically than globally. Oh…. Also, of note… even though the blog links to the Wikipedia page… you don’t HAVE to be limited by what’s on it… if you happen to have a dark horse pick that is not on it but you think is going to clean up… go for it. I just realized you can see some early RT scores before the movie comes out. I don’t think anything big enough to matter is coming out in early January, but you could have some extra information for a late round pick. yeah. I’m super excited about this. John Darowski yeah and then made it all up again.